This weekend, I had the pleasure of attending two great events that celebrated the lives and voices of women in music. When something like that crosses my newsfeed, I tend to stop scrolling and click on any accompanying links. 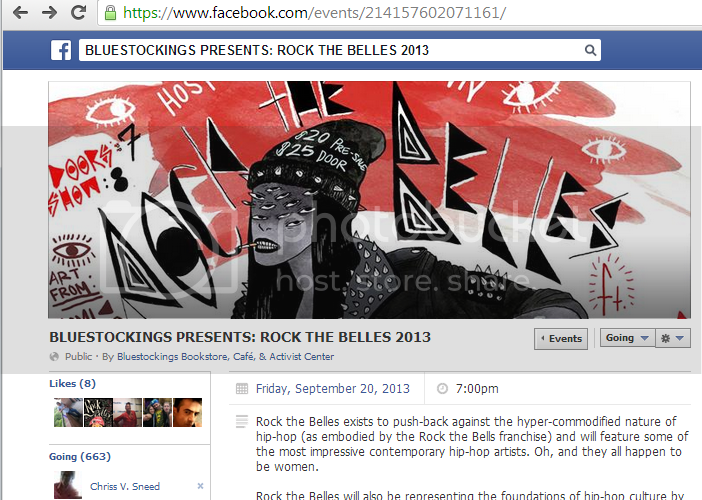 A play on the name of another huge musical event, Rock The Belles sought to provide a hip hop music scene that wasn’t associated with capitalist consumption and the hyper-sexualization of women and girls. The set-list, which featured an all-woman ensemble of hip hop artists, B-Girls, DJs and poets, caught my attention instantly as I cased Facebook for more information.Thoroughly intrigued, I bought two tickets and decided head over to Gowanus Loft for a fun date night. Right off the Smith-9th F, Gowanus Loft was less than a 3 minute walk from the Subway, making it easily accessible by public transportation. As I entered the room, dozens of people milled around the venue, which was surprisingly larger than I expected. As I peered around, I noticed that the walls contained hanging works of art from different artists, alongwith pieces being created throughout the show. Catching the end of Supreme's set, the sounds of solid beats and fluid lyrics filled the room with an eclectic vibe. The show continued with a cool DJ set accompanied by a B-Girl dance crew that wowed the crowd with break dance and personal moves. However, during a 5 second break between the dance crew left the dance floor empty, the room cooed as a toddler slid into the spotlight and showed off some special footwork. After the DJ wrapped up the B-Girl showcase, an aerial artist captivated the audience with her finesse and languid movements, some of which made my heart in my throat with nerve-wracking excitement. After an impromtu 20 minute dance party and intermission, the show continued.